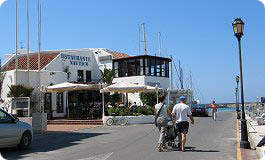 The habour in Almerima has over 40 Tapas Bars, Restaurants and Cafés. 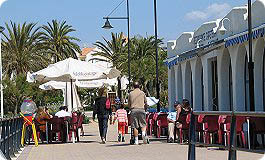 In the following we give some samples of Tapas Bars and Restaurants that is worth visit. In additional are there also many Bars with music and dance where you can have a great night. Tapas Bar and Restaurant in the first row to the sea. 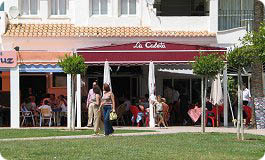 Take a table outside and order a small beer for les than 2€ and get free a tapas with or at 2 pm. go into the entrance dining room and order "Menu del Dia". Price: Menu del Dia 10€. Execelent Tapas Bar with specialty in Combined Plates and Tapas. Take a table on the terrace and order a small beer for 2,5€ and get free tapas of your own choise. Take 3-4 beers and you have got your lunch. Price: A beer with tapas 2,50€.